Libby was 16, she had bulimia. She died. She was failed by multi-agency services. We want a public inquiry into the failings in her care to prevent this from happening again. I have heard from my solicitor today who has advised the following..
On August 26, 2017 our wonderful, clever, intelligent daughter Libby died. She had just turned 16. In the space of just a couple of years, Libby transformed from a bright, ambitious young girl into the victim of orthorexia, anorexia, and bulimia. Libby was so much more than her illness and her death. We are Rosemary, Libby's mum, also a nurse and Ricky, Libby’s dad, who lives and works in Brussels. Libby, and her brother Alex, enjoyed a close, loving and active relationship with us both. We are all angry and frustrated, broken. We want to know why Libby did not receive early specialist support and the subsequent therapy that she needed to prevent her unnecessary death. We are determined to find out what happened and what could have been done to prevent Libby’s death. We want to know what changes are needed to improve services for others suffering from eating disorders. This is only possible through a full and fierce inquest. Please contribute to our legal challenge now and share this page with your friends, family and on social media. Libby was a beautiful young woman. She was clever, powerful, argumentative, loving, supportive, and caring. Libby had an empathy for others that she did not receive when she needed it most. The usual teenage tantrums aside, as parents we were sure that Libby was on a good path. She had like-minded, sensible friends and was in control of her life. Usually Libby made wise choices, sometimes with just a little guidance from us where needed, and we felt blessed to watch her growing into a successful young woman. Libby’s decline into anorexia and subsequently bulimia and anorexia was slow and invisible. It began with a diet. As parents we kept a close eye on her weight loss, we never once considered that a simple diet could be the start of the terrible journey we'd unwittingly embarked on. We naively believed our child was smart enough to be sensible and that we would notice if not. Tragically by the time we realized that Libby had an eating disorder her condition declined rapidly. Our GP referred Libby to CAMHS (Child and Adolescent Mental Health Services). The CAMHS Team seemed to have little specialist knowledge of eating disorders and Libby struggled to engage with them. Exploring every possible avenue, we took Libby to a private psychologist who agreed she needed help but we were unable to access this help. Bulimia finally caused Libby’s potassium to reach such a dangerously low level our GP was finally able to admit her to hospital. Her BMI alone was not low enough to meet guidelines for eating disorder interventions. Aged just 16 and two weeks and against our and the GP’s wishes, she was placed on an adult ward rather than a paediatric ward where she could be supervised closely. Both CAMHS eating disorder service and Newbridge eating disorder clinic assessed Libby while in hospital and agreed that inpatient care within an eating disorder clinic was necessary, after initially agreeing to this, Libby later refused to go to the clinic voluntarily. Acquiring the necessary mental health section took a week, it was finally raised on a Friday evening after the time that Newbridge had said they could admit her. When told she would be admitted under section but had to stay in hospital for the weekend, Libby ran and had to be found and recovered by police and security. After 3 months at the clinic and against my will, Libby was discharged. She had received almost no therapy and had not recovered. I told staff she had not overcome bulimia, I was ignored. Appropriate medical checks weren’t made before discharge. During the first two weeks following her discharge Libby had two hospital admissions for dangerously low potassium. Both times CAMHS and Newbridge were informed. No actions were taken to keep Libby safe. I warned she would die without proper help and needed to be readmitted. Libby persuaded everyone she was recovering, the CAMHs team decided to place her re-admission on hold. Why were the risks I had raised not taken seriously? Why was action not taken to immediately readmit Libby? The following week, after collecting her GCSE results and having been accepted into college, Libby's heart stopped. The Coroner has ruled that Libby’s death was natural, due to hypokalemia (low potassium levels leading to cardiac arrest) and has ruled that an inquest is not necessary. Clinically this is fact, however, what has not been considered is that Libby had a serious mental health condition (bulimia) that resulted in hypokalaemia and death. We believe, along with the support of our solicitor and barrister that opening an inquest to investigate multi-agency failures is in the public interest; however we need to get over the first hurdle which is to convince the Coroner to open an inquest into Libby’s death. Our legal team have advised that the first step in doing this is to obtain expert evidence from a Consultant Psychiatrist with expertise in treating children and adolescents with eating disorders to give an opinion on whether Libby’s death was as a direct result of her mental health condition. We will also ask this expert to comment on a number of other issues that would hopefully then persuade the Coroner that an Inquest must be opened into Libby’s death and that this Inquest should be Article 2 compliant. We are asking for your support. We need your help to fund the instruction of an expert and thereafter for representations to be made to the Coroner to convince him to open an Inquest. Our solicitor has agreed to reduce her fees to minimum Legal Aid rates such is her belief in Libby’s case. To submit our appeal to the Coroner will cost approximately £1,500- £5,000 on top of the significant amounts we have already spent on getting legal advice. In addition to this we will also need to pay for an expert to support our case as we need evidence that bulimia is a mental health disorder and that it led to the hypokalaemia that killed Libby. This evidence will be submitted along with the submissions to the Coroner to open an inquest. The eventual total cost of this action is likely to be in the region of £7000. We are therefore starting with an initial target of £3000 to get the process underway but will then go on to raise as much as we can to support this legal action. 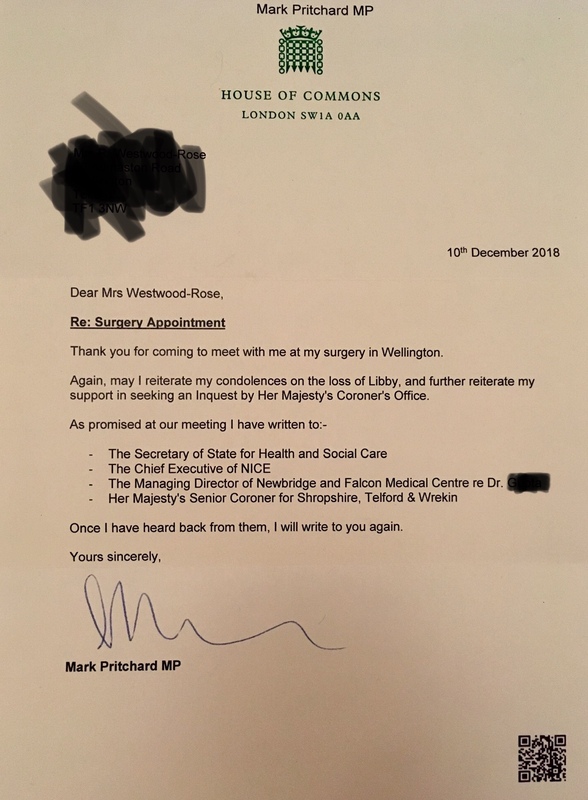 I have this evening received an email from Dr X confirming that he is now in a position to start working on Libby’s case and asked for the papers. He has asked for them electronically so we will ensure that bundles are sent to him electronically by the end of this week. Hopefully we will have the report within the next 6-8 weeks. Great news! My solicitor advised me on Friday (one day before Libby’s 18th birthday) that an expert witness we need to support our appeal to the Coroner has been found at last. Many consultants were approached, most did not reply, one had a conflict of interest but really wanted to help as she believed we have a case. My campaign to convince the coroner to open an inquest will go beyond simply achieving justice for Libby.. I will continue to seek ways to advocate for the urgent need for easily available information and signposting to enable early intervention... I will not give up.. please support me, thank you. ED is not a choice..
We’ve reached £3k.. I worried we wouldn’t, but your support has been phenomenal. Mark Pritchard MP now backing us!! Night night from the UK.. Thank you for an amazing Day1.. we’ve covered Part 1 - Initial Solicitor fees. Now for Part 2- Expert Psychiatrist who will provide evidence that bulimia is a MH illness, not a choice! Could you all email the link to friends who don’t use Fb who may wish to support us.